Last night my husband and I drove to downtown Ann Arbor, as we often do on Friday nights, and decided to give a brand new restaurant a try. And when I say brand new, I mean brand new. It only just opened on April 21st in what used to be the Borders flagship store. The restaurant is called Slurping Turtle, a unique, memorable name for a unique, memorable restaurant. All of the dishes we ordered at Slurping Turtle are ones that I will crave until the next time we eat there. The pork belly bao were soft and pillowy and had just the right amount of sweet and sour. The homemade ramen noodles were perfectly al-dente. And then there was the desserts. We ordered the macarons, black sesame ice cream, and the green tea cream puffs. All three of them were delicious, but my favorite were the green tea cream puffs. More than anything else, those cream puffs are what I will be craving until our next visit. 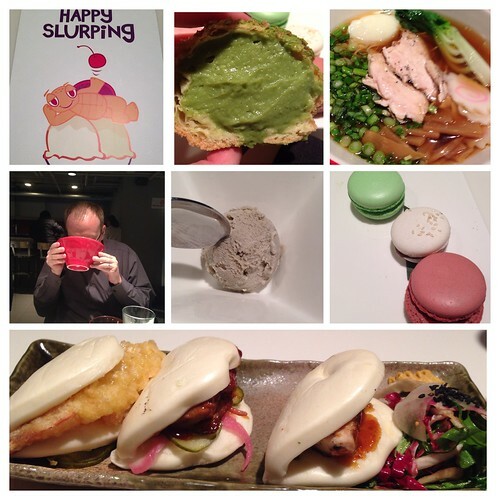 Slurping Turtle isn't quite up to full speed yet: they currently only have a dinner service and they have yet to procure their liquor license, but even operating at less than 100%, the food and service were wonderful. I would go back in a heartbeat, and most likely will over and over again. If they continue with their wonderful food and great service, most likely Slurping Turtle will be added to my list of favorite restaurants in Ann Arbor. Pork belly! I am so there!! Sounds like an up and coming place and a fun place to eat! That restaurant looks delicious! I recently went to one with a similar theme minus the sushi (Foo Dog in Richmond, VA) and loved the bao! 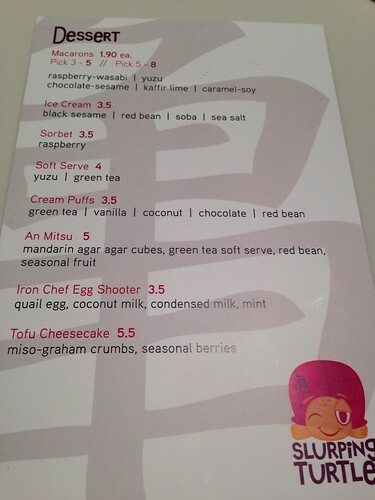 That place looks like fun--any place where you can try three desserts is a win. Cheers! What a fun adventure. I adore the macaron flavors -- terrific fusion. Ooh the food sounds so good - and what a fun name for a restaurant! Adding this to my list for next time I'm in the area. The bao looks awesome.